Thing is, I don’t have a 100% correct list anywhere. For example, during our European tour in March 2014 I took a picture of this old tour shirt in Rome, but I know for sure that some of the dates were changed after the shirt was printed. I need help figuring out which. And let’s keep it to the first tour for now. To make it interesting I’ve gathered some old photos from the tour. I was invited in as a session guitarist during the summer in 1997. 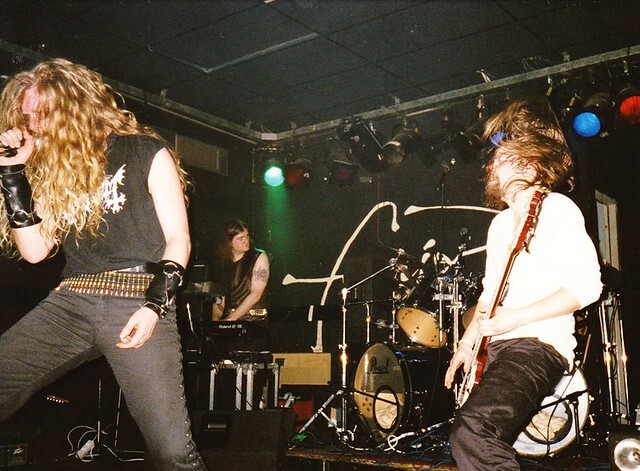 Øystein had received some requests from Century Media Records to embark on a tour as The Olden Domain was released. This first tour was supposed to be in Sept- 97 already, so I went over to Bergen in July to start rehearsing. The lineup at this time was the same as the recording lineup + me. During the days in Bergen we had a dialog with Garm about the situation, and Garm announced that he was not able to tour with us. He was to busy with Ulver and other stuff. 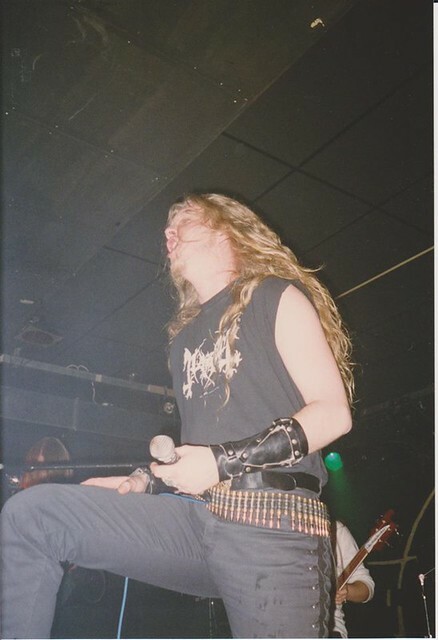 Garm had given this a lot of thought and wanted to suggest a vocalist who would be able to do both the clean and screaming vocals. He told me that when I got back to Oslo I should go to the Elm Street club and look for Simen Hestnæs. So I did. 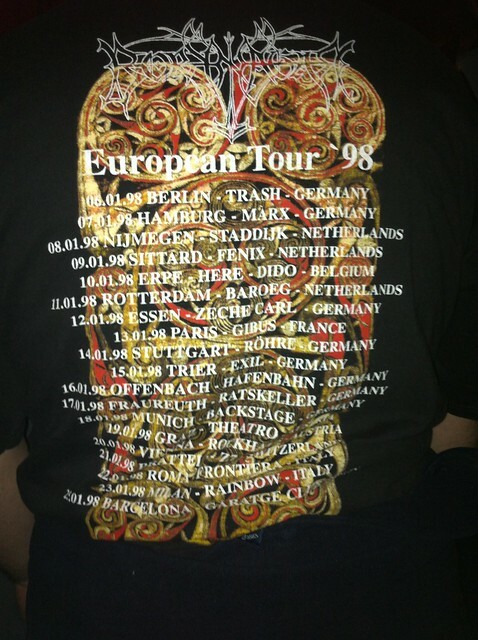 This was not in time to accept the tour in Sept- 97, we rescheduled and ended up as support on the first In Flames European headliner tour in January 1998. I still get questions about the 1997 tour, and the fact is that our cancellation came a bit late as a result in the change of lineup. There were posters printed with our name on it, something we saw on several clubs we visited in January 1998. 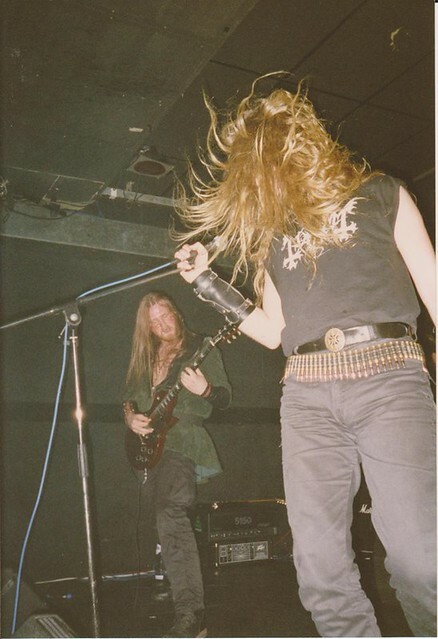 ICS Vortex, Ivar Bjørnson and Kai Lie. The late Grim behind the drums. Then the gig in Barcelona was cancelled because the trip was simply too long and we couldn’t make it. It was replaced with a last gig somewhere in Switzerland. And see how the tour had no off-dates! Now, if you guys can help out confirming what you know so I can get this right it would be great. When the list is done I’ll make a new page for this and we will talk about the rest of the gigs in 1998. -First comment is in and the gig in Roma was indeed moved to Bologna. Anyone remember the club name? -Bologna venue was called Il Tempo. Ah yes, that actually sound right! 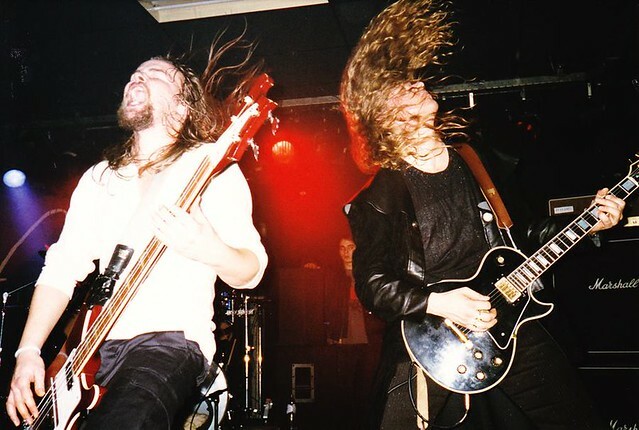 I still have some pictures of the Borknagar concert in Staddijk Nijmegen Jan 8th. Please let me know where to send them if interested. I have a question for Jens. Now, I’m not sure if the wacken concert was part of the tour or not, but how come you left the stage during Universal? I’ve only heard rumours, but in the video it seems you just turn off the marshall and walk away. Thanks! the second gig in Switzerland was in a town called “Düdingen”, venue “Bad Bonn”. Yes, a little restaurant somewhere in the middle of nowhere with a tiny stage just about large enough for your average metal band’s drum kit. Loved it!